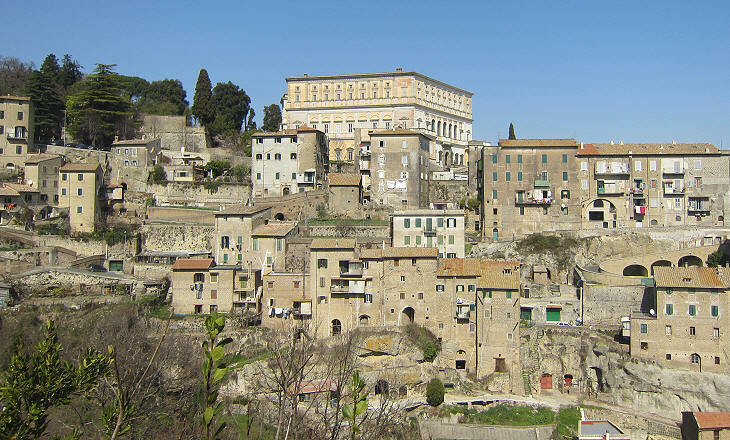 Palazzo Farnese is located at the top of Caprarola, a small town which was redesigned in the XVIth century along the street leading to the palace. From S. Teresa, a monastery located on a hill opposite Caprarola, one can notice the unusual angle formed by the façade and by the left side of Palazzo Farnese which is due to the pentagonal shape of the building. Palazzo Farnese was initiated by Cardinal Alessandro Farnese seniore who commissioned Antonio da Sangallo the Younger the construction of a fortified residence; this aspect of the original building is still evident in the two towers which flank the main entrance. In 1534 the cardinal became Pope Paul III; the construction of the palace at Caprarola was halted because Sangallo was commissioned a long series of new works, including Palazzo Farnese in Rome, new walls around the Vatican (Porta S. Spirito) and the redesign of a section of the ancient Roman walls (Bastione del Sangallo). Cardinal Alessandro Farnese iuniore (junior) was a grandson of the pope and in 1559 he decided to complete the building initiated by his grandfather. When he made this decision the papal court was a dangerous place for many cardinals. Pope Paul IV easily suspected them of being hidden Lutherans and Cardinal Carlo Carafa, his greedy nephew, wanted to enlarge his possessions at the expense of the other great Roman families. In 1555 Cardinal Guido Sforza di Santa Fiora, a cousin of Cardinal Farnese, was arrested with the charge of helping pope's enemies. Most likely Cardinal Farnese thought that remote Caprarola would have been a nice place where he could wait for the pope's death. In December 1559 the election of Pope Pius IV allayed Cardinal Farnese's fears. 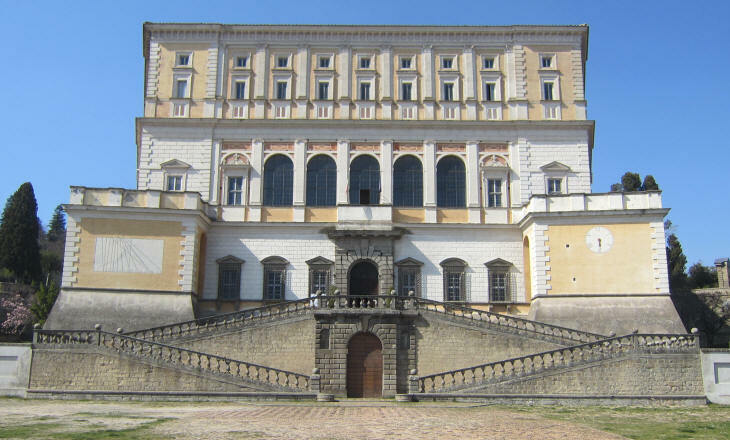 He decided that the palace at Caprarola should become a monument celebrating himself and his family. He was a man of great culture and the decoration of the palace has many references to the Classical World. Some of the subjects depicted in the frescoes were suggested to him by his friend Annibal Caro, a poet best known for his translation into Italian of Virgil's Aeneid. The decoration of the main hall celebrates Hercules in an unusual role, that of the creator of the volcanic lake near which Caprarola is located. One of the frescoes shows il Vignola, the architect whom Cardinal Farnese commissioned the completion of the palace, and in the background a temple with a golden statue of Hercules. 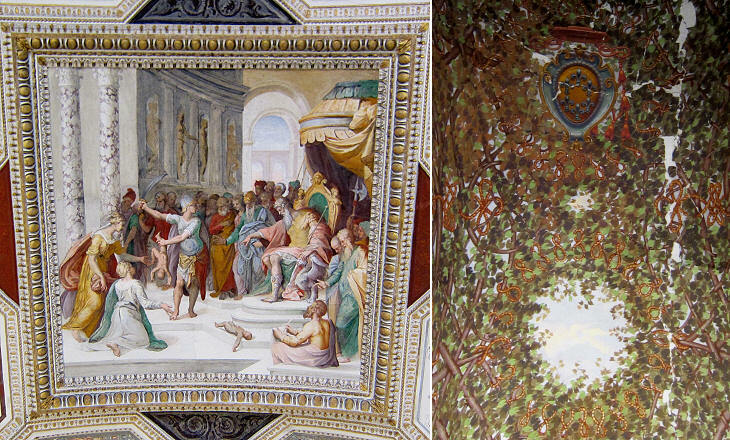 The fresco was meant to suggest a link between Hercules and Cardinal Farnese and between the temple to Hercules and Palazzo Farnese at Caprarola. The temple in the fresco had a circular shape (and it resembled Tempietto del Bramante at S. Pietro in Montorio) and this aspect was taken into account in the design of the courtyard of the palace. The shape of the courtyard influenced that of the whole building, because a circle can be inscribed into a pentagon better than in a square. 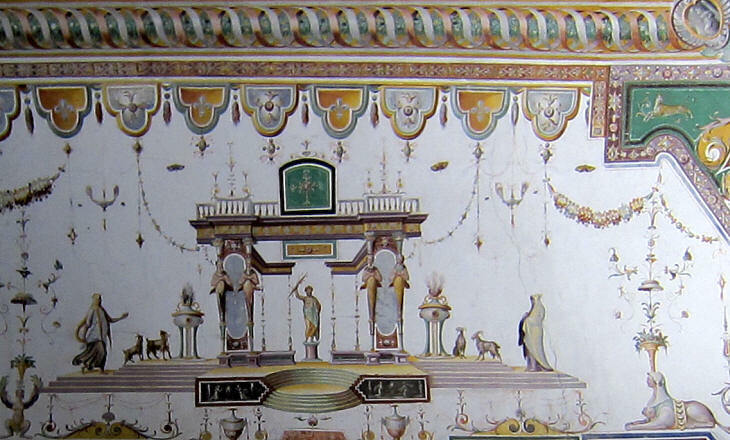 Towards the end of the XVth century the halls of Nero's Domus Aurea were discovered by chance. 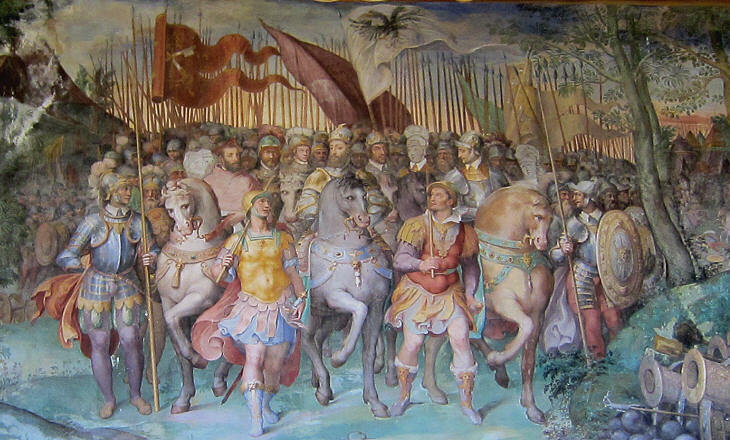 Their decoration was the first opportunity Renaissance men had to see a large sample of ancient Roman paintings. Immediately artists started to copy them and because at the time Domus Aurea had the appearance of a series of underground caves these paintings were called grottesche. 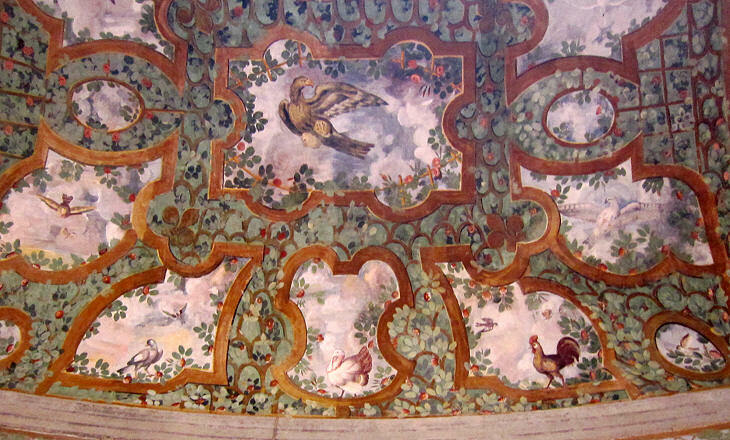 With the exception of the three main halls where large frescoes cover the walls, grotesques are the prevailing decoration of the palace. 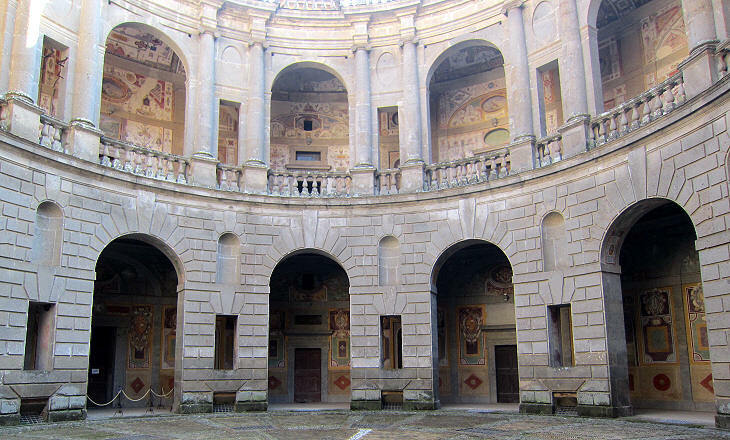 The decoration of the courtyard was most likely suggested by that of the portico of Villa Giulia. 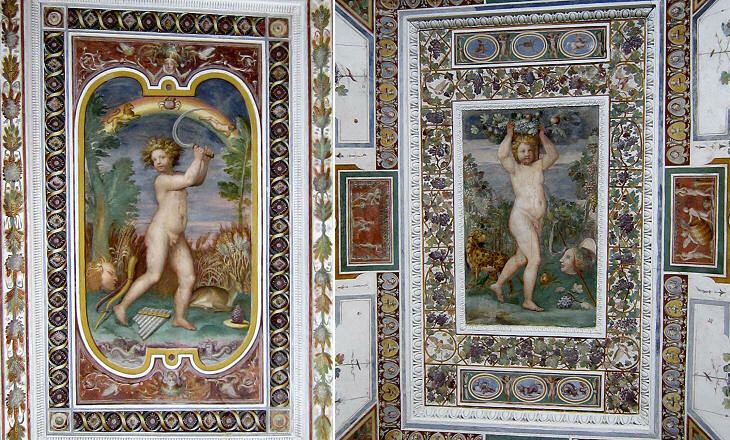 Overall the decoration of Palazzo Farnese is similar to that of other palaces/villas built at approximately the same time such as Studiolo del Cardinale at Villa Medici and Palazzo Altemps. Cardinal Farnese was a man whose life spanned one of the most important periods of Europe's religious history. He was appointed cardinal in 1534, when the Protestant Reformation was still considered by the pope as a matter for the Inquisition from a theological point of view and a conflict among German princes from a political one. When Cardinal Farnese passed away in 1589 the Roman Catholic Church had just ended an overall review of its dogmas, principles, ceremonies and attitudes towards the arts to respond to the Reformation. Cardinal Farnese was very supportive of this change, he was involved in the works of the Council of Trent and he helped the Jesuits by building il Gesù, yet, apart from the frescoes in the palace chapel, it is rare to see a religious subject in the many paintings which decorate the rooms of Palazzo Farnese. At a time when lifts (elevators) did not exist the design of a staircase needed to to satisfy both practical and aesthetic requirements. At the beginning of the XVIth century Donato Bramante designed a spiral staircase which allowed Pope Julius II to reach Casino di Belvedere on a mule. 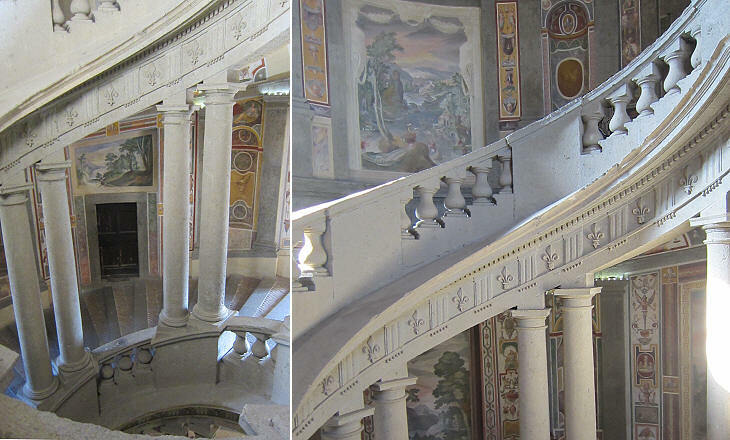 This staircase was the model Vignola utilized for Scala Regia at Palazzo Farnese. The low steps could be ascended by a mule and even by a small size horse, so that the illustrious guests of Cardinal Farnese could reach the stately halls on the first floor without dismounting. The use of twin columns can be observed in later staircases and in particular in those at Palazzo Barberini. Most likely the key worry of Pope Paul III during his pontificate was not how to deal with the Reformation, but how to keep good relations with Emperor Charles V and King Francis I of France who were continuously at war with each other. In 1539 Cardinal Alessandro Farnese was sent to the court of Charles V to work for a peaceful solution to his conflict with Francis. In 1540 he accompanied Charles to Paris for a meeting of the two sovereigns. One of the three main halls celebrates the diplomatic activity of Cardinal Farnese. 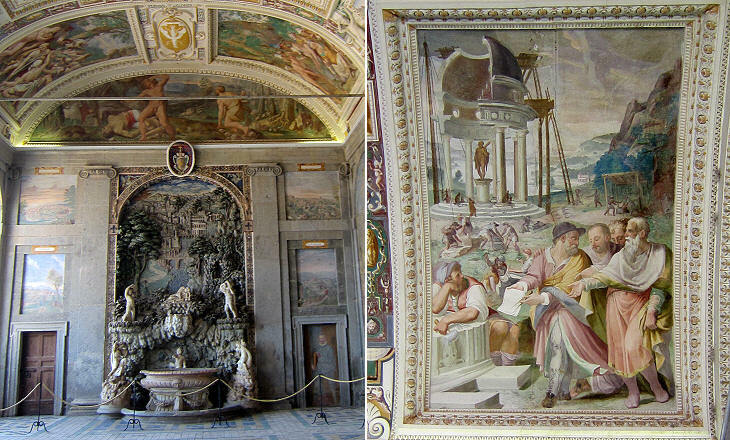 The same decorative theme can be seen in the main hall of Palazzo Farnese in Rome. In 2011 the number of visitors to Musei Vaticani was in the region of 5,000,000; even those who went there just to see Michelangelo's frescoes could not fail to admire Galleria delle Mappe Geografiche, a large corridor decorated with maps of Italy. 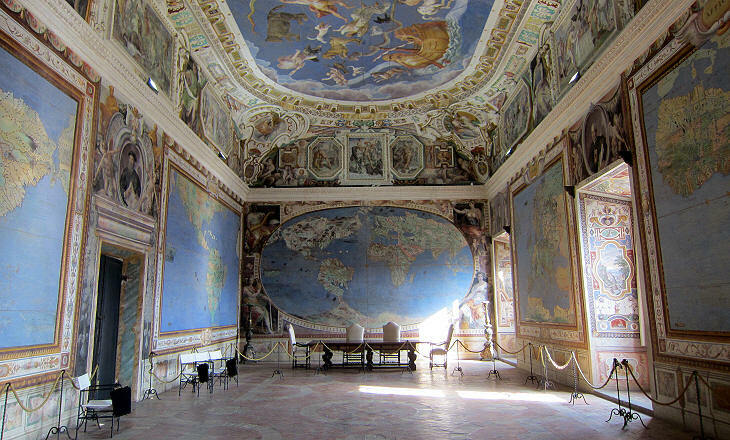 Palazzo Farnese di Caprarola is visited by a mere 70,000, but the hall decorated with maps of the whole world is even more impressive than the Vatican one (in addition it is not crowded). Giovanni Antonio da Varese painted maps of the four continents, Palestine and Italy and a Mappamondo, a world map. During the second half of the XVIth century the Roman Church and in particular Pope Gregory XIII promoted the development of astronomical studies which eventually led to a reform of the calendar. 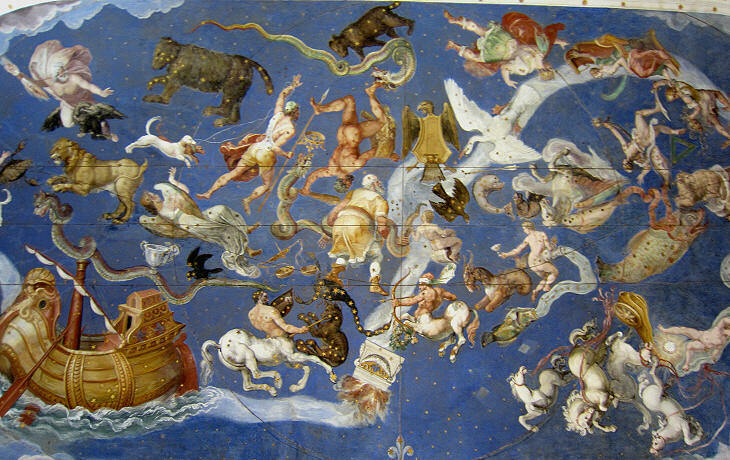 Unfortunately we do not know the name of the painter who decorated the ceiling of Sala del Mappamondo with the constellations and their symbols. Cardinal Odoardo Farnese, grand-nephew of Alessandro, utilized and maintained the palace, but after his death in 1626, the Farnese lost interest in Caprarola. The palace was stripped of its furniture and works of arts after it was inherited in 1731 by Charles of Bourbon (Charles I of Parma, VII of Naples and III of Spain). Move to the Gardens of Palazzo Farnese. Sarebbe un errore, se, avendo dimostrato le magnificenze antiche e moderne di Roma, e suoi contorni, non guidassi ora il mio Lettore a vedere il celebre palazzo fatto erigere dal Card. Alessandro Farnese nipote di Paolo III. 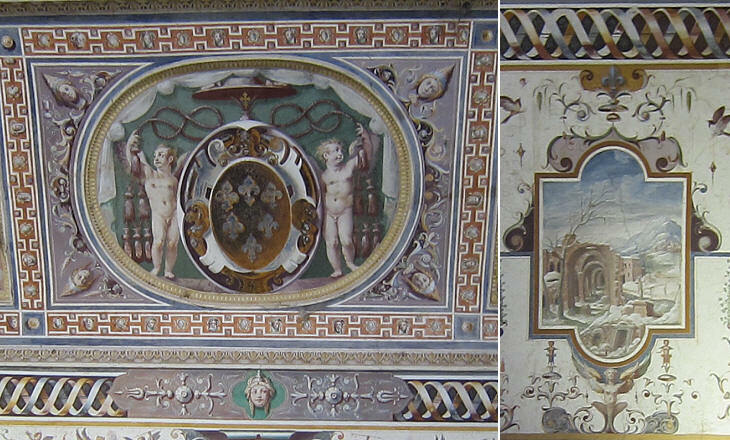 Giacomo Barozio da Vignola ne fece il disegno in figura pentagona, con baluardi e fosse d'intorno a modo di fortezza, facendo nobilissimo invito una doppia cordonata alla magnifica piazza, e delizioso ingresso al superbo palazzo una scala a due branchi con ponte levatore; ed altra nobilissima e maravigliosa scala fatta a chiocciola con colonne doriche e balaustri, lavorata sì perfettamente, che sembra tutta di getto; con un cortile sferico cinto di portici e di logge. Tanto le camere, e sale del primo piano nobile, quanto quelle del secondo, i portici, le logge, e le scale sono tutte a volta, ornate di vaghissimi stucchi, e capricciose pitture a grottesco fatte dal famoso Antonio Tempesta. Nelli sfondi delle camere, e delle sale sono dipinte varie favole proposte da Annibal Caro a Taddeo, e Federigo Zuccheri, i quali dipinsero ancora alcuni fatti celebri de' Farnesi, che il Card. Trajano Acquaviva fece incidere in rame, ed insieme le piante e alzate dell'edificio, per compiacere gli eruditi dilettanti.